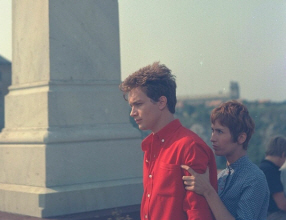 Watching Miklós Jancsó’s The Confrontation (Fényes szelek, 1968) one can’t help but think of famous US melodramas about troubled youth and the struggle against hypocrisy such as Rebel Without a Cause or West Side Story. 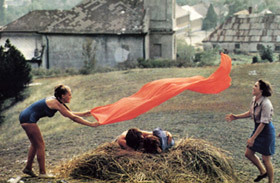 In his first foray into colour film, Jancsó proves himself as much a master of a striking palette – costuming his actors in symbolic red, for example – as he had demonstrated himself capable of building tension through a careful choreography of individuals such as in The Round Up or The Red and the White. Rather than the personal traumas of such US classics, with their focus on racial, familial or romantic power struggles, The Confrontation uses music and dance to muse upon and dissect the political ideology of students, in the wake of newly founded Communist rule in 1947 Hungary. Clearly reflecting the events of the time – student riots in Paris – Jancsó’s vitality as a director is perfectly attuned to balancing weighty, philosophical dialogue and the inner squabbles of the student group, with striking visual flair. At the start we see a group of students stop military cars on the road in a pacifist demonstration, blocking their way and lying on the ground when provoked to move on. Gradually some of the soldiers join them in dancing, but their actions are watched at all times by the police officer, Kozma (András Kozak, of The Red and the White) who’s offering of advice or criticism seems to provide the audience perspective as the actions of the group escalate. Entering a monastery in order to challenge the pupils there regarding their ideas of democracy, free education and the use of power; the leader, Laci (Lajos Balázsovics) beco mes challenged himself when another of the group, Jutka (Andrea Drahota) deems his non-violent negotiation and debate-based tactics too weak to accomplish their goals of imposing Marxist teachings. Using somewhat underhanded tactics to topple him from leadership – she claims a majority decision has been made but no evidence is shown to back up her pronouncement – Jutka then proposes more aggressive modes of persuasion. The notion of the group as terrorists hangs over the action of the film – and is demonstrable by their humiliation of non-conforming pupils via tactics that veer dangerously close to those of Nazi concentration camp officers. That hair-shaving doesn’t take place, but vandalism does; ultimately becomes controversial enough for Jutka’s power play to be disciplined thus proving that within political parties, the consensus regarding objectives – such as imposing Marxist ideology – is subject to the same internal (and essential) diversionary ethical debates regarding methodology. 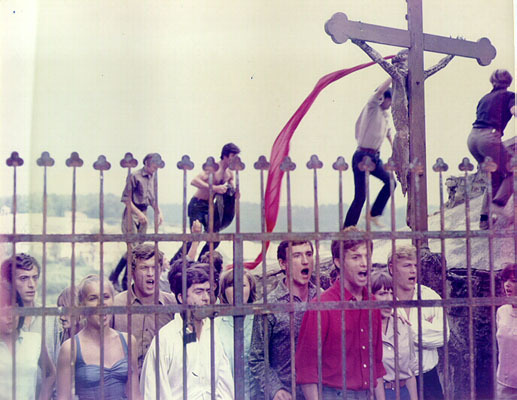 Typical of Jancsó, the action is shot using long, fluid takes; camera movement following individual conversations, then slowly zooming out to focus on the group singing, then pausing on specific confrontations. It’s gorgeously rendered and choreographed, the brightly dressed students contrasted with those of the monastery in their grey uniforms enhancing the way the film uses musical genre conventions and their expectation of melodramatic subject matter to incongruous effect. Accompanying this fantastic restoration by Second Run DVD is a detailed and fascinating essay about Jancsó’s career by author Graham Petrie, which provides insight to the great director’s political and aesthetic filmmaking trajectory.